A large woodland peninsula, the Bailey Peninsula, jutting into south Lake Washington, has been preserved since early in the century Designed by the Olmsteds, Seward Park today remains one of the larger forest parks within city limits, providing views of Mount Rainier, Mercer Island, and the Seattle skyline. You can hike along and around the shoreline of the peninsula or up and over it. From I-5 take Exit #163 and head south on South Columbian Way. Take a right on Beacon Ave. S., and then take a left on S. Orcas St. At the bottom of the hill, take a right into the park. You can also drive the length of Lake Washington Boulevard until it ends at Seward Park. Trails now lead all through the nearly 300- acre-park, along the beach, up to picnic grounds, and to an old fish hatchery, now closed. Some are steep and lead to high vantage points. Bikes are prohibited on forest trails, but allowed on paved roads. For generations, swimmers have liked swimming from the shallow sandy beach. Boat races and water-ski exhibits attract summer crowds on the waterfront, as do baseball games, and band concerts above. A women’s triathlon benefiting breast cancer research has been held in Seward Park in recent years. Begin walking on the path leading uphill from the Torii, or along the road beside it. Either will lead you to a sheltered picnic area, looking down over Andrews Bay, named for W.R. Andrews, an early homesteader and Park Board commissioner. At the top of the hill just beyond this fork is the amphitheater with a stage used for summer concerts. Restrooms at street level and by the beach. Lincoln Park lies on Puget Sound, so its western views are of Puget Sound and the Olympics. 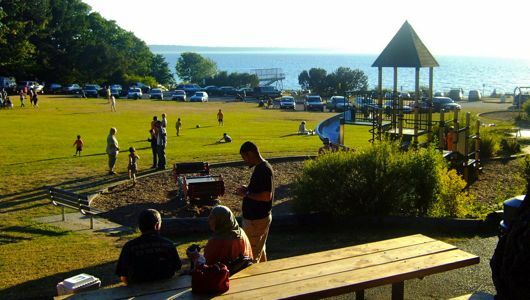 It offers steep wooded paths, and level paved trails, but to get to the shoreline promenade with the most gentle descent, drive to the south part of the park and find the path near the ferry landing to reach the paved waterfront path. The saltwater beach is accessible to families with toddlers, and there are shelters for picnics. Families will find the 1 3/4 mile trail north to Colman Pool, filled in summer with warm salt water, a good destination. From I-5 take exit #163A to the West Seattle freeway staying left for West Seattle. Follow the signs to Fauntleroy Ave. SW and the ferry. At the end of the freeway, stay on Fauntleroy as it curves to the left. The road bears left to cross Alaska St. and California Ave. Go about 2 miles. The park is on the right at SW Webster. You may choose to park in the first parking lot. (the north lot) or the last one on the south end, close to the ferry dock. To walk the nearly five miles of paths in this park, you can begin at the north parking lot on Fauntleroy Way opposite Southwest Webster Street, and head straight west toward the windswept trail along the bluff overlooking the Sound. You will come to the intersection of the broad bluff trail, with a choice of north or south vantages. It makes no difference which direction you choose; you can descend to the water in either direction, but the steepest descent is in the center. (Logically, this is the one to take going down.) Along the edge of the bluff are benches where you may rest and enjoy views of the Olympic Mountains, boats and ships, and the islands in the Sound through the red-barked madrona trees on the slope. Crows along the paths and gulls below compete loudly for attention. Eventually, you will want to drop down to the beach level and Colman Pool, the bathhouse and the curious underground restrooms. The pool is only open during summer months; a small fee is charged. Picnic tables can be found throughout the park, and those close to the pool are particularly popular. Since no food is available to buy, bring a snack or your own picnic. Follow the wide paved path along Stony Beach at water level. On a windy day the surf swirls and foams beside you, and on a warm calm one, children play in the waves. From the south end of the park, you can see the Fauntleroy ferry dock just around the corner. Note: There are many paths, ranging from wide, paved stroller­‑and wheelchair–accessible to narrow trails. Unfortunately, there are no park maps. Return to your car or bus along a different path. Seattle’s largest park with 534 acres of beaches, meadows, ravines, and woodlands, Discovery Park lies between Elliott and Shilshole Bays. It offers a maze of walking paths and roads. Some are left from the 19th century when the park was a federal Army fort, Fort Lawton. The park was named for George Vancouver’s ship the HMS “Discovery,” which sailed past this point in 1792. When Vancouver first saw the madronas along the bluff, he thought they were magnolias and so named it Magnolia Bluff. Paved roads and trails are open to bicycles and paths are open to hikers only. The park holds a mix of natural and cultural resources, including old military installations. You can look for woodland second growth, grassy meadows, and an historic district of old officer’s homes and barracks, Daybreak Star, an Indian cultural center, viewpoints along the bluff high above the Sound, and miles of undeveloped salt-water shoreline beach lit by a historic former U.S. Coast Guard lighthouse. To get there from I-5, take exit #169 or #167 and follow Elliott Avenue, as it becomes 15th Avenue West. At Dravus Street turn left or west. Follow it and turn right on 20th Avenue West which becomes Gilman Avenue West, then West Fort Street which becomes West Government Way, leading into Discovery Park at 36th West and West Government Way. The Environmental Education Center, where you may get a map, is on the left. Park there or continue to the South parking lot off West Emerson Street. If you want to hike the 2.8-mile Loop Trail, follow paved roads past a military cemetery and choose the North Parking Lot. Bus access from downtown at Fourth and Stewart is by Metro bus #33 or #24. From the Visitor’s Center and North Parking lot start on a 2.8-mile paved path south of the grassy playfield, wind uphill briefly on a paved road, then turn left onto a gravel path signed “Loop Trail.” Drop to a grassy clearing, watching for bald eagles. Continue across a road, and then take the path up left alongside military housing. The trail reaches the first vista of Puget Sound next, opening up to sweeping views of the Olympic Mountains and freighters. Be careful to stay inside the log barriers. Sand and clay banks continually erode and slide into the Sound. Below on the beach, you will find large deposits of clay, which have slid from above. You cannot drive, but you can hike down a paved road through the woods to the former Coast Guard lighthouse and beaches. Visiting hours for the oldest lighthouse in Seattle are from 1-4 PM on Saturdays, Sundays, and holidays. The West Point Metro Sewage Treatment Plant also occupies this landscaped sand spit. From the lighthouse, the North Beach trail goes through a newly created landscaped area along the earthen berm, which hides the sewage plant. Look for extensive plantings of native trees, shrubs, wildflowers and an unexpected freshwater pond between the beach and the hidden sewage plant. Descend another steep path with overlooks like those from a small plane out to Mount Rainier, and Elliott Bay. At the foot of Magnolia Bluff find both rocky and sandy beaches and miles of beachcombing opportunities. Excavated sites have shown that for centuries Native Americans used this area to dry fish and collect shellfish. You can also turn and explore the South Beach area by following a marked trail to its beaches and tide pools. This is the westernmost point in Seattle, so on a clear day, you should be able to see Alki Point, Vashon Island, container cargo ships, ferries and, floating above them, the Olympic Mountains. Climb the steep trail back up to join the Loop trail near the Dunes. Back on top at the highest point of the bluff find picnic tables and sweeping views of the water, ferries, and downtown Seattle. Round a corner to come out in a grassy meadow with historic officers’ homes and the fort church on the skyline. Stay on the bluff part of the path, unless you want to view the interesting old homes, and walk south until you reach the end of the park. The Loop Trail turns east or left, and with a slight climb, you will reach the paved road through the old officers’ homes. Cross it to find the concrete post marking the Loop Trail again. Continue on the Loop Trail. After the South Meadow come to the South Parking Lot, to find a posted map showing you have come more than halfway. The choice of trails and roads is confusing. Stay high and wind east. Just below is the Environmental Education Center with park information, displays and children’s activities. Signs leading to the Daybreak Star Indian Cultural Center will tempt you to view its collection of Native American exhibits. You can also walk the Wolf Tree Nature Trail, a half-mile self-guiding marked trail featuring wetland marsh and the oldest trees and native plants in the park, not logged since the 1860s. Twenty-two stations identify such objects as burls, witches’ brooms and moss forests. Continue left until you reach the road you drove in on. You can stay on the Loop Trail or follow the road back to your car or bus stop. Carkeek Park has winding woodland trails to explore; for older kids an Education Center, and Environmental Center; Piper’s and Venema Creeks where chum salmon spawn in season, and a saltwater beach. The Salmon to Sound Trail leads down the stream to Puget Sound. From mid-October to Thanksgiving time families watch here for spawning fish fighting their way upstream. Because trains pass the Park every day, children will want to climb the staircase next to the beach to look down on them and listen to their hooting, puffing sounds. The North Meadow at the end of the North Bluff trail is an expanse of grass playing fields; imaginative play equipment, and picnic areas. Kids enjoy this park at every time of the year. From I-5 take exit #173. Go west on Northgate Way, cross Aurora Avenue, continue west and cross on Greenwood Avenue North. Angle left or west on Holman Road NW. Go three blocks and turn right on 3rd Avenue NW. Drive 5 blocks to NW 110th Place, turn left and follow signs to Carkeek Park, dropping down a winding Carkeek Park Road to enter the park. Pass the environmental center, and take the road leading back uphill to a parking lot overlooking Puget Sound and the Olympics. Metro bus #28 will also get you there. At the park entrance, you can stop at the Education Center and Environmental Learning Center to check out any upcoming festivals, classes, and events. A native plant garden, backyard wildlife sanctuary, rainwater collection and retention system, and solar panels are other feature to search for. Follow the Salmon to Sound trail all the way to salt water, and count on seeing returning chum salmon spawning from mid-October to Thanksgiving Day. The Suquamish Tribe gave chum salmon fry to be raised and released here by local children so mature fish, once imprinted with Venema Creek, would return to Carkeek Park. Walk down the creek into the wooded park along wetland ponds and swamps adjoining the trail. Look for flourishing native plants and birds. During the winter many trees stand in pools of water. Raised trails follow wooded pathways out to the salt-water beach. On the south side of the lower grassy area, a trail ascends the bluff offering outlooks over the Sound and the North Beach residential area. Trains passing daily along the waterfront are fun to watch and listen for from this vantage point. Or from the sewage treatment plant across the creek, and walk east along the creek on a trail past the restored pioneer orchard and climb up to the southeast edge of the park at NW 100th and 6th NW. Ancient apple trees still bear fruit in season. Additional signed trails both north and south of the ravine have been built and graveled; metal bridges over Venema Creek make travel over muddy wetland safe, clean and easy. Restrooms: for patrons of restaurants, stores and museum. More than a quarter million Asian Americans from more than 30 different ethnic groups live throughout the state, yet within a few blocks of Seattle you can see and savor most of them and experience the essence of Asia. From the north: Take I-5 to exit 164A (James Street). Follow 6th Avenue straight ahead, across Yesler to South Washington Street. Park on the street or in parking lots on Washington or Main. Or, from downtown, drive south on Fifth Ave. to S. Jackson Street. From the south: Take I-5 to T-Mobile Park exit (Exit#164B). Turn left onto 5th Avenue and go to Jackson Street. Turn right onto Jackson; turn left onto either 7th Avenue or Maynard and park along the street or in a lot. Begin your walk at its highest point at the top of South Washington at the Nippon Kan Theater and Kobe Terrace Park. Built in1909, the Nippon Kan Theatre was a cultural center for Japanese immigrants. Restored in 1978, the theater is now privately owned and used for events such as judo and kendo competitions, flower displays, art shows, kabuki, and community events. It is on the National Historic Register. When I-5 was built it divided the Yesler Terrace community and left the small triangle on the west side, which became Yesler Park. Renamed Kobe Terrace Park in the 70s as part of Seattle’s Sister Cities program, the park contains plaques in both Japanese and English about the goodwill between Seattle and its sister city, Kobe. Kobe donated the prominent 200–year old Yukimidoro “Snow Viewing Lantern” stone lantern and surrounding cherry trees. On a clear day, this high point offers a walker stunning views of Mount Rainier and an overview of the International District. Look across to the superb tower at the top of Beacon Hill, originally built as the Marine Hospital, which became the Pacific Medical Hospital. It was recently bought by Amazon.com. Make your way down through the one-acre Danny Woo International District Community Gardens on its paths and steps. Depending on the season you might see elderly residents cultivating their small terraced gardens containing traditional Asian fruits and vegetables. You can also walk around the park and down the hill on Maynard — both routes offer outlooks over the south end of the city. Turn right onto Main St. at the bottom of the garden and walk past the Panama Hotel at 605 South Main on your left. Personal belongings of some of the Japanese who were sent to internment camps are stored in the basement, still waiting for owners to claim them. Turn left onto 6th Avenue. The locked door leads to a former public bathhouse in the hotel’s basement. Continue downhill on 6th Ave. On the south wall of the N–P Hotel (Northern Pacific) Hotel at 306 6th Ave. S. is an old painted vertical sign advertising rooms for 50 cents and up. If the door is unlocked, walk into the lobby to view the permanent exhibit of photos of historic Japantown. Across the street, the restored wooden building is the Main Street School Annex. Built in 1873, it was the second public school in Seattle and played a major role in the Asian community, serving as the education center for second–generation Asian Americans. Turn left at the corner of Jackson and 6th Ave. Just up from the corner is the former Higo Variety Store, now an imported art store. Cross Jackson. The United Savings and Loan Bank was the nation’s first Asian–American owned savings and loan association Note the historic mural of “The Eight Immortals,” at the entry, painted by Fay Chong. Walk up Jackson to Maynard to the Bush Hotel, now the Bush–Asia Center. Today it has been rehabilitated into low–income residential units. An open-air produce market frequently operates at the corner of Jackson and Maynard. Fresh Asian vegetables and fruits are sold from crates on the sidewalk to eager shoppers. Turn right onto Maynard Ave. S. (heading south). Across the street, the 14–foot bronze sculpture, “Heaven, Man and Earth” by Seattle sculptor George Tsutakawa portrays the totemic forces as stylized characters designed like cairns piled in Tibetan fields. Continue on Maynard to the corner of S. King St. to reach Hing Hay Park. Often a staging area for events, this park is a community focal point. Look for the dragon mural by John Woo on the back wall of the Bush–Asia Center and the red-tile-roofed Grand Pavilion given by Taipei. Look also for a memorial to the ten Chinese Americans who died in World War II. Walk to the corner of South Weller and go up (east) on South Weller to Maynard. Turn left on Maynard and right onto King at the next corner. Look across the street at the large building across the street. Goon Dip built the Milwaukee Hotel in 1909, then the largest in Chinatown, to house visitors to the 1909 Alaska-Yukon–Pacific Exposition. Continue to the Wing Luke Museum at 719 South King Street. Named for the first Chinese American elected to the Seattle City Council, this is the nation’s only museum preserving the entire spectrum of Asian American cultures. Rather than showing traditional Asian art and history, the museum illustrates the experience, culture, and lives of early Asian immigrants to the Pacific Northwest and their contributions to it. Its permanent exhibit titled “One Song, Many Voices” includes donations of diaries, photographs, and artifacts from local residents. Retrace your steps to the corner of South King Street and cross King Street. playground with the children’s murals, to 8th Ave. Turn left and continue north on 8th Ave. to the corner of King for the Tsue Chong Noodle Factory, also known as the Rose Brand Fortune Cookie Factory. The owners give tours only to schoolchildren, but you can walk into the shop at the next corner and buy a bag of “unfortunate flats”, or failed fortune cookies. Retrace your steps down Jackson. As you return to your car, you may want to succumb to the inviting aromas from the restaurants and bakeries along the way. Return to your car or bus stop. Leave I-90 at exit 25 (State Route 18, Snoqualmie Parkway) and go left, across Snoqualmie Ridge. Continue down the long hill to the railroad tracks and stoplight. Turn left at the signed intersection, go over the bridge, and drive 0.3 mile to the parking area at Snoqualmie Falls Visitor Center. Officially the trail starts near the Snoqualmie Falls Visitors Center and descends 1⁄2 mile to the powerhouse, but most people start at the lower parking lot as described here. From I-5, take I-90 east to Exit 22 and drive to Fall City. From there go north on State Route 202, signed “North Bend.” At 2.4 miles go right on 372nd Avenue SE and continue for 0.7 miles to the road’s end (elevation 120 feet). Snoqualmie Falls is so beautiful the local Indian tribe considers it a sacred place. You can admire the 268-foot falls from a parking lot viewpoint and walk down a steep path to the plunge pool, or you can hike with your children one mile to the base of the falls. Puget Sound Energy has harnessed the falls for their power, but you can walk around the power station gate to the station powerhouse. See kayaks and rafts being launched there in the eddying current. On the other side of the powerhouse, follow the rocky trail to a dead-end viewpoint up the face of the waterfall. Kids and families have appropriated the rocky riverbed beach, sandbars, bedrock benches, caves, and pools. Begin by walking around the power station gate and down the paved South East Fish Hatchery Road to the station house. Pass the trail from the Visitors Center and take the second trail, behind the power station. Part of this trail is completely enclosed with fencing, like a cage. Kids can look through powerhouse windows to the turbines generating power from the waterfall for 16,000 homes. On the other side of the cage, you can follow the trail either down to the rocky riverbed or on a fenced boardwalk to a dead-end viewpoint of the falls. To continue beyond the viewpoint, walk back toward the power­house and find a short path to the river. Once on the riverbed, proceed through boulders toward the waterfall as close as you wish. In midsummer when water levels are low, children stop to wade in pools at the river’s edge. Families find niches and boulders along the bank for picnicking in the mist and spray. At the base of the majestic falls, people stop and stare wordlessly upward at the plunging, free-falling curtain of water. The sight is so compelling it is hard to turn away and the sound of the falls drowns out all conversation. From I-90 east of North Bend take Exit 32 onto 436th Ave SE. Go left or south on 436th Avenue, SE Cedar Falls Way, and drive 2.7 miles to reach the park. Just before entering the park’s gate, turn right into the Rattlesnake Ridge trailhead parking lot. 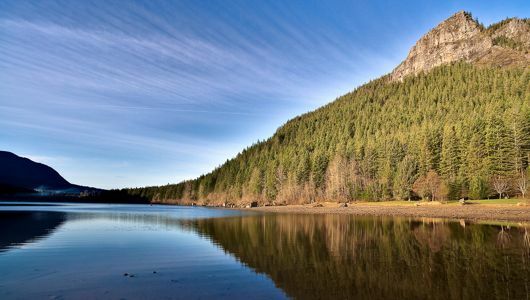 To reach the trailhead, walk on the graveled road that bends around the north side of Rattlesnake Lake. Elevation is 920 feet. A wide trail runs around scenic Rattlesnake Lake past a picnic area on the west side to the south end. On a hot day instead of climbing to the Ridge, the kids may prefer to stay here for wading and swimming, or it may instead be a reward you can offer after they return. Rattlesnake Ridge has been beloved for decades as the eastern-most peak of the Issaquah Alps, and for its great 270- degree outlook over Mt. Si, Chester Morse and Rattlesnake lakes, and the Middle Fork Snoqualmie Valley. Children love taking their dogs along and guessing why it’s called Rattlesnake Ridge. Tell them early settlers thought the whispering sound of grasses blowing in the wind sounded like rattles, but that there are no snakes here. Another reward for after the hike is the Cedar River Watershed Visitors Center, where a town called Cedar Falls once stood and which contains natural history and art exhibits children will love. In the Rain Drum Courtyard you can listen to drums played by amplified raindrops. Begin upward in old 2nd growth forest on gradual switchbacks. Children will see occasional giant boulders studded and encrusted with ferns and moss, along with old cedar stumps left over from logging days. At about 1 mile the kids can expect the first view straight down to Rattlesnake Lake. At 2 miles they will emerge from the forest onto the rock ledges and views of the Middle Fork Snoqualmie Valley. Hang onto the hands of children here because the drop is severe. Sit down, get out the map and lunch and enjoy the spectacle of Mount Si, Mount Washington, Chester Morse Lake, Rattlesnake Lake and the Middle Fork Snoqualmie around and beneath you. From I-5, drive east on I-90 to Exit 34 (the Edgewick Road) and turn right on 468th Avenue SE. Continue 0.6 miles, turn left on SE 159th, and find a parking lot in another 0.6 miles at the road’s end (elevation 600 feet). This Washington State Parks trail was rebuilt in late 1989, as compensation for a new hydroelectric project, the Weeks Falls Power Plant, farther up the river. The walk through magnificent old-growth forest leads to views of two South Fork Snoqualmie River waterfalls. 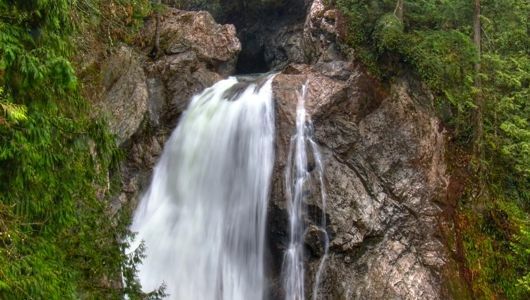 Chil­dren will love everything about this hike: the moss-covered nurse logs, the enormous cedar and fir trees, the panoramic view at waterfall level from a viewing platform, and the bridge crossing over and between two waterfalls. The wonder of falling water forming into spray, drop­ping, dropping, and then becoming river again holds timeless fasci­nation for children of all ages. From the river, the trail climbs again. The kids will love the side trip down a flight of 103 steps to a viewing platform opposite the falls. Families stand transfixed at the spectacular sight of the sculpted cliff covered by falling white water. Back on the trail continue up a fern-covered ridge, at times within sound of the freeway, past enormous moss-covered gray blocks of basalt. Reach the bridge over the top of the falls 13⁄4 miles from the lower parking lot. The bridge is substantial enough for the most timid; from here, stop to gaze at the powerful two-stage upper falls. Jagged gray boulders lined with maidenhair ferns channel the water first right, then left. For other impressive views, cross the bridge and walk 1⁄4 mile to another enormous old tree where a family can munch and ponder the force of water. Take the Kingston ferry from Edmonds. From the ferry landing drive west on State Highway #104 to George’s Corner (or Kingston Crossing). Turn right onto Hansville Road NE on Road #104 for 7.4 miles. Before you reach Hansville, turn right onto NE Point No Point Road for 1 mile to the old lighthouse. Parking is limited. Elevation is sea level. A tour of a historic lighthouse can be combined with a beach walk around Point No Point and a short forest hike through a county park to make a loop walk. Children will love the old lighthouse, the sugar-sand beach, the big rock from which sea creatures can be inspected, and the short woodland loop hike. During salmon runs, fishermen stand in the waves to cast from the shore near the point. Begin by touring the old lighthouse, built more than a century ago, and open on weekend afternoons. Continue beyond it, on a brief trail lined with wild roses between a wetland and the driftwood-studded sandy beach. A memorial blind invites a stop for ships, pleasure boats, and birds. Two public beaches are on DNR land. The waterway is a major shipping lane for tankers and freighters, so the kids can always see some kind of craft. Kayakers and fishermen like Point No Point too. Continue north on the beach for a check of the tides from the big erratic rock and for a view of gleaming Mount Baker on a clear day. A flight of stairs leads up into the 1/2-mile forest trail into Point No Point County Park’s woodland shaded by old second-growth trees, refreshing on a hot day. The trail emerges onto Hillview Lane NE. Follow it back down to the lighthouse. A nearby alternative hiking trail network is the Hansville Greenway near Buck Lake, a large warm freshwater lake. From I-5, drive east on I-90 to North Bend and take Exit 31. Exactly 1 mile from the east edge of town, turn left on SE Mount Si Road and cross the bridge over the Middle Fork Snoqualmie River. Park beside the bridge. Turn left to walk 1⁄4 mile east past homes to the signed trailhead, elevation 500 feet. Too many beginners with children take on the Mount Si Trail, which proves to be so difficult that the kids may never want to hike again. Overlooked is kid-size Little Si, also difficult but more realistic, offering children the challenge and satisfaction of climbing to a rocky summit with a view. Along the way are a wonderful mossy forest and an old rockslide to travel through before starting up. For years to come, children will see Mount Si from the freeway, look for the cliff separating the two Si’s, and point with pride to the mountain they have climbed. The trail starts up steeply at first, and then forks several times. There are a number of trails that go right. Trails leading up or right go to Mount Si, but none of the forks are signed. Choose those leading left and continue west toward Little Si. Your route will lead around the base from south to north between the two mountains. Enormous old boulders have tumbled down the cliff separating the two peaks; the resulting rockslide is now covered by moss and shaded by firs and hemlocks. Look for a tiny log cabin with a mossy thatched roof, filled with rescue equipment and labeled “Emergency Shelter and Rest Area.” Children love peeking in and will want to stay in it because it is just their size. The trail starts steeply up again on the west side of the mountain through salal and over rocky ledges. At the summit, a dry microclimate has encouraged pine and manzanitas to grow. From the summit slabs, children can look out over the valley and across to Rattlesnake Mountain. The foothills below contain Rattlesnake Lake, the distant South Fork of the Snoqualmie River, downtown North Bend, and the up-close meandering Middle Fork Snoqualmie River. Now turn and gaze at the face of massive Mount Si behind you, close enough to breathe on. Tell the children that when they get a little older, that summit can be their objective. About the author: Joan Burton has written several books and magazine articles on hiking and outdoor activities. Her website joanburton.org has lots of information on hiking with children and contains a great urban walks section. Twin Falls is NOT easy for kids! I saw so many sad little tykes ready to pass out. This hike is definitely for much older kids! Excellent list of place to hike in and about Seattle. When taking hikes with tykes, having neat stops along the way is paramount, and all of these hikes boast some intresting things and places to see along the way. Wonderful pictures of the hiking trails around Seattle. I went till the 3.5 mile mark, didn’t go till the haystack. I went till the meadows below the haystack. Wow awesome list! My son loves the great outdoors. My husband and I took him to Spring Canyon last year and he keeps on insisting to go back. There’s another, Steamboat Rock Park that we’ve been meaning to check out.